If you don’t know by now, I am and have always been a die hard NY Mets fan. As far back as I can remember I was rooting for the Blue and Orange of Queens. Growing up so close to the stadium (Shea, now Citi Field) that should come of no surprise. Also with my dad growing up as a Brooklyn Dodgers fan the natural progression for him was to become a NY Mets fan. It has been many years since I have read this book but for a guy who hated (and probably still does) to read, this was one book you had to tear out of my hands. I was 13 years old in 1986 and as a young impressionable Mets fan back then, this was my team “for life”! 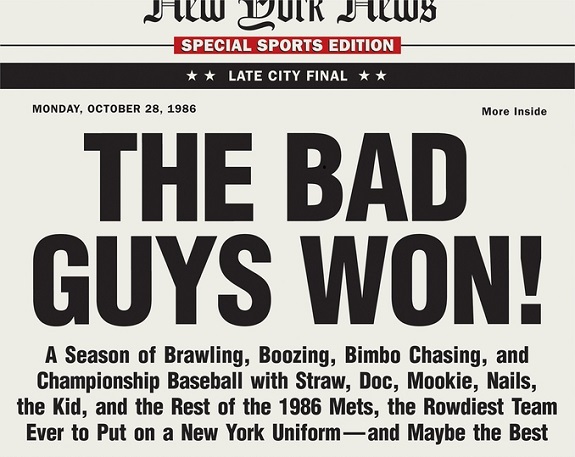 “The Bad Guys Won” was originally said by then Mets manager, Davey Johnson after the Game 6 win over the Boston Red Sox in the 1986 World Series. This book is written by a former Sports Illustrated writer who was an avid Mets fan. Several Mets from the 86 roster such as Bobby Ojeda, Keith Hernandez, Gary Carter and Ron Darling share moments previously unknown about what went on when the Mets were off the field. Especially rowdy was the plane ride home from Houston to NY from the 86 NLCS and the food fight and coke snorting that occurred. This book also shows the stardom and downfalls of the “Dynamic Duo” The no.2 winning-est franchise pitcher behind Tom Seaver in Mets history, Dwight “Doc” Gooden and the all time Mets home run leader Darryl Strawberry. 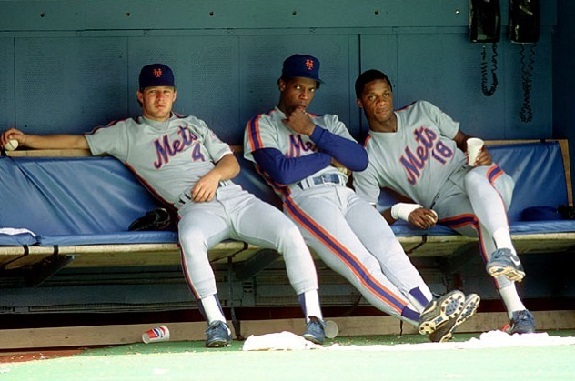 Interestingly, many teammates were shocked to find out that Doc was as big a cocaine user as he was, but the always rowdy and cocky Darryl Strawberry’s drug use was never in doubt. One comical event the book recalls was when the Mets were playing the Sox in the 86 Series and were in Shea Stadium, then B rate movie star Michael Sergio parachuted into the stadium carrying a huge flag that said “Go Mets”. Sergio was later arrested and sentenced to 21 days in jail. Never before and probably never again will you see another person parachute into a stadium during the World Series. Only with those NY Metropolitans. Sadly, the book also reviews bad trades and releases made by the organization that broke up what so many thought was going to be the next great dynasty in baseball. If the team had stayed in tact, they would have been that dynasty. If you enjoy baseball and the gossip and corruption of it, you will love this book. The 86 Mets were one of the greatest teams of all time and without a doubt the wildest.